We test the multi-room and advanced music streaming capabilities of the Marshall Acton, Stanmore and Woburn speakers. Can you really go wrong with the Marshall sound signature? 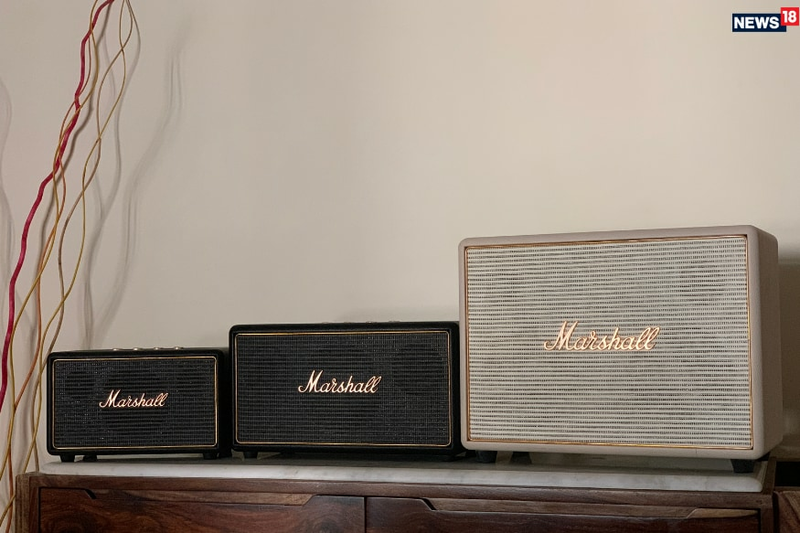 British audio company Marshall is one of the first names that you would think of, if you are in the process of listing out premium audio brands. And not without good reason too. The current range of Marshall speakers are instantly recognizable because of the unique personality that has become their trademark—the front grille, the Marshall logo adorning it, the dial knobs at the top and the leather wrapped design. See a Marshall speaker sitting in between speakers from a dozen other premium audio brands, and these would be instantly recognizable from a mile away. Over time, the Marshall speakers adopted the wireless standard popularly known as Bluetooth, for streaming music from phones, PCs and tablets, for instance. And it isn’t just the looks that has made it a favorite with music aficionados, but the vibrant sound signature that worked brilliantly with any genre of music you wished to listen to. In many years, not counting the incremental updates or adding new speakers to the line-up, this is in many ways the biggest update that Marshall speakers have received—the multi-room streaming capabilities. Three speakers from the Marshall line-up have been updated for the multi-streaming feature—the Acton, the Stanmore and the Woburn. All three of these speakers also cost a pretty penny. The Acton (Rs31,999), the Stanmore (Rs40,999) and the Woburn (Rs52,999) aren’t exactly your affordable wireless speakers. In terms of the size, the Acton is the smallest—but don’t be fooled by the size, because it packs a punch. Then there is the Stanmore which is the go-between for larger rooms while the largest of them all, the Woburn, pack in the potential to scare the living daylights out of your neighbors. Quite frankly, we love the retro design of the Acton, Stanmore and Woburn. It does invoke a sense of nostalgia that in some ways soothes our furrowed brow. It does virtually give us a warm hug after a tough day and tells us everything will be okay. With the dash of retro also comes a lot of solidity. These speakers are heavy. For instance, the smallest Acton is around the same height as the Apple HomePod smart speaker, but twice as wide. 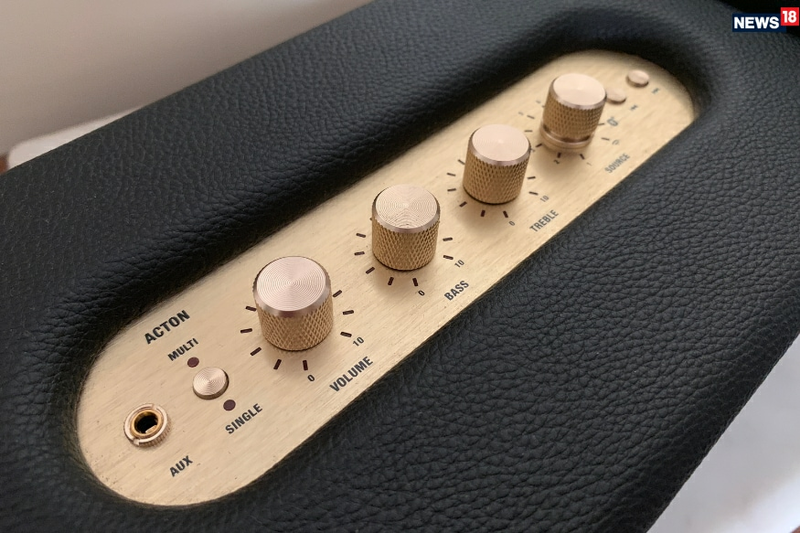 The front grille on all three of the Marshall Multi-Room speakers is very similar to our first-generation Kilburn speaker, with the brass and gold inserts. At the top are the dial knobs, for various controls—source, bass, treble and volume. 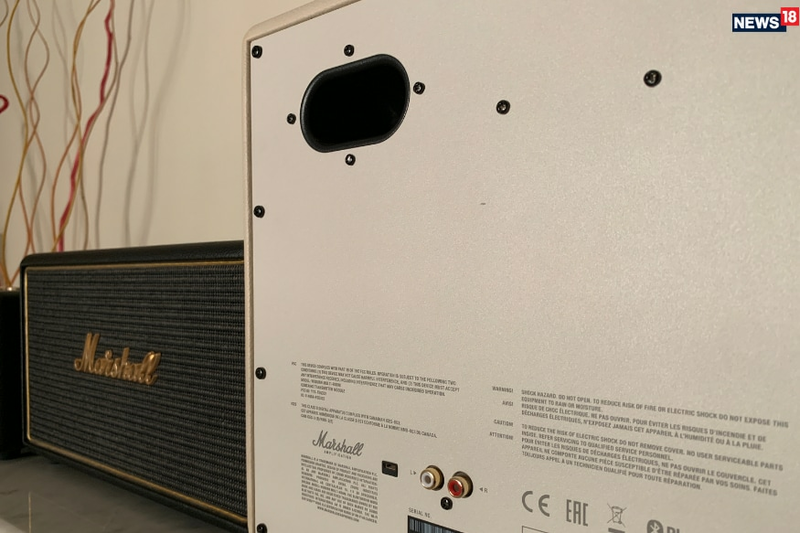 What really makes the difference is the fact that the casing of each Marshall speaker is thick, robust and anyone who understands sound would know how much of a positive impact that has on the sound signature and sound quality. The sound signature of all three Marshall Multi-Room speakers remains exactly the same as the predecessors. It is neutral, and very comfortable with any genre of music you may wish to listen to. The physical controls for tweaking the sound (treble and bass) come in handy when you wish to make some tweaks. The sound, even from the smallest Acton, is powerful and room filling. The Acton has one 30-watt amplifier for the woofer and two 10-watt amplifiers for the tweeters. The Stanmore has one 50-watt amplifier for the woofer and two 15-watt amplifiers for the tweets. The largest Woburn packs in two 40-watt amplifiers for the woofer and two 15-watt amplifiers for the tweeters. The larger size of the Woburn allows for more bass, but in terms of vocals, it is at par with the Stanmore. 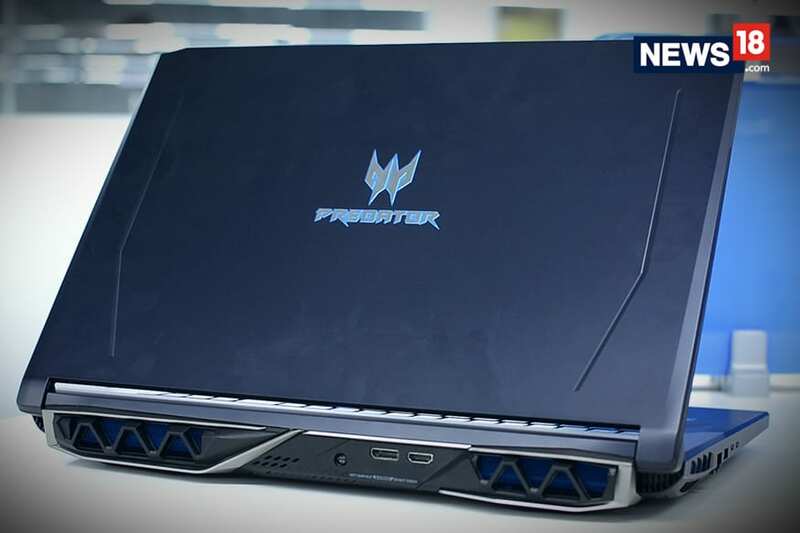 That is some serious power being packed inside speakers that look fantastic too. Turn up the volume, and the sound just does not betray any sense of disturbance or distortion. Bass levels are fantastic, and that has us sold. There are a lot of connectivity options on each of the Marshall Multi-Room speakers. For instance, all three have Google Chromecast, Apple AirPlay, Bluetooth, AUX and the 3.5mm headphone jack options. Interestingly, this is the first-generation AirPlay, and not the newer AirPlay 2. The larger Stanmore and Woburn also have the RCA connection (you will identify this as the red and white connection placed on the back panel). In certain other countries, streaming service Spotify’s Spotify Connect is also a source that you could have accessed with these speakers, but since it isn’t available in India officially (you have to jump through hoops to make it work), that option is off the table at the moment. Plug these in, and you can get started immediately by setting these up individually in the “single” user mode, pairing with Bluetooth or the Aux-in connection and playing the tunes. But for the exact purpose you bought these Marshall Multi-Room speakers for, you will need to download the Marshall Multi-Room app (free for Android and iOS) to set these up. Since these speakers work with Google Chromecast for instance, you will need to download the Google Home app (free for Android and iOS) too. Among the dials on the top, you would also see a dial marked as “Source”. While Bluetooth, Wi-Fi, AUX and RCA are easily identifiable (also because they are clearly marked), there are also sources numerically labeled 1-7. That is really interesting—for one simple reason. Customization. In the Marshall app, you to choose online radio stations—and your favorite ones there can be added to these presets for one-touch access. While app we downloaded on our phones in India shows Spotify as an option, the streaming app isn’t officially operating in India just yet. The other big advantage is that you don’t have to open the app every time and can make do without actually having to pick up your phone. You also cannot get away from the fact that all this goodness comes with premium price tags. The Acton is priced at Rs31,999 while the Stanmore will set you back by Rs40,999 and the range topping Woburn will cost as much as Rs52,999. The entire idea of the Multi-Room is to be able to chain a few speakers together, wirelessly across you home, and shift music between them depending on your preference, location or mood. That means, you’ll have to buy more than one of these to actually get the full experience. Nevertheless, this is just another example of the versatility that Marshall has exhibit for its consumer line-up of products. Each of the speakers in the Multi-Room line-up has a purpose that is pre-decided—in terms of where it will fit best in your home.